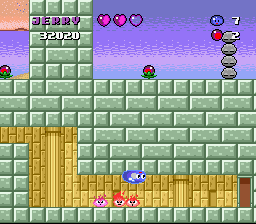 SNES Smart Ball (USA) in 15:55.43 by nitsuja. This movie is about a boy that gets turned into a blob and then goes on an adventure to get back at the bad guy. The blob (Jerry) can stretch himself upwards or downwards and kill all the enemies that he touches while stretching. The author of the movie makes Jerry stretch for only a fraction of a second when he encounters enemies which makes it seem like Jerry can kill anything by just touching them. The movie doesn't lack speed or complexity but it might only be fun to watch by someone who has played the game before.